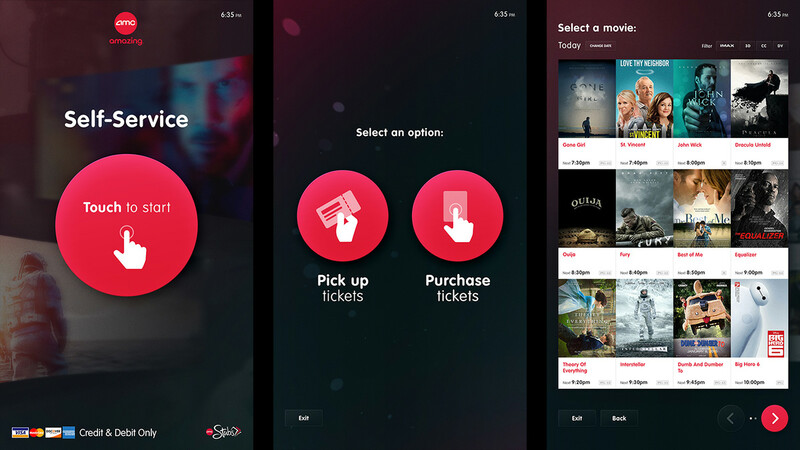 AMC Theatres approached Firstborn to help them improve their ticket kiosk sales. After analyzing multiple movie theaters, the kiosk positions within the theaters, the kiosk signage, kiosk product design and kiosk interface, we developed a plan of attack. To utilize the current kiosks we created an interface that works with their current software and hardware so we could quickly improve the design and user experience. But we also made a vision and strategy for the future. If the kiosk is not in use it shows an AMC Theatres branded attract loop featuring the available movies. On top of the dynamic content there's a clear call-to-action so people know they can interact with the screen. One of the bigger changes we made was to simplify things. Each page is focused on a single action. In this case to pick up tickets or purchase. When selecting a movie, the movie titles and times are now easier to read and it's now clear that you can filter the movies and that there are more movie options than this single page. Some quick details of the selected movie are always visible at the top. All the tapable elements are always placed vertically in the middle so they are easy to reach. If the user selects the movie, the poster will rotate curved in 3D space. Inspired by the AMC branding, to give depth and a more cinematic feel to the experience. In some theaters it's possible to select your seat(s). Each theater has different options, seat amounts and layouts which was one of the more difficult design challenges to solve. The user has an overview of the entire room and can swipe to see other sections. But because the hardware lags a lot we also placed arrow buttons at the bottom which only require a single tap. The summary shows a clear overview of what you are about to purchase before you receive your tickets. 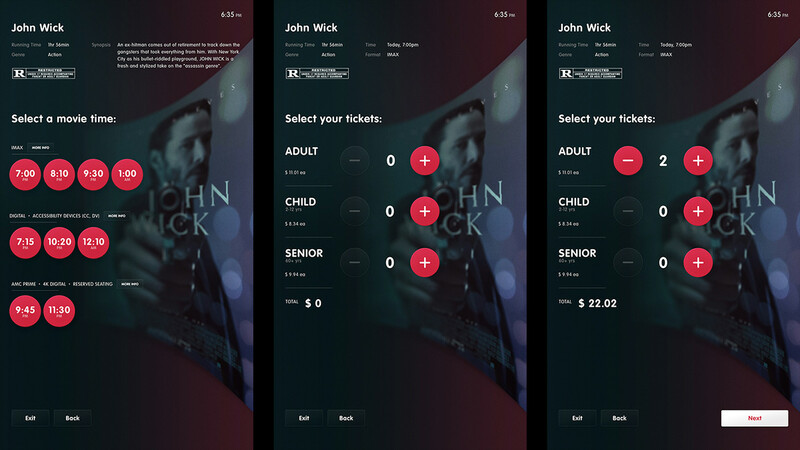 AMC Stubs is an important part of the AMC Theatres experience but the option is not needed until this step within the user flow. So only here it comes up and is again a clear option of yes or no. The order and copy of these screens were very confusing before. With this update it's now very clearly explained what to do, step by step. A new feature is showing a completion screen displaying the remaining time before the movie starts and the theater and seats you've to go to. 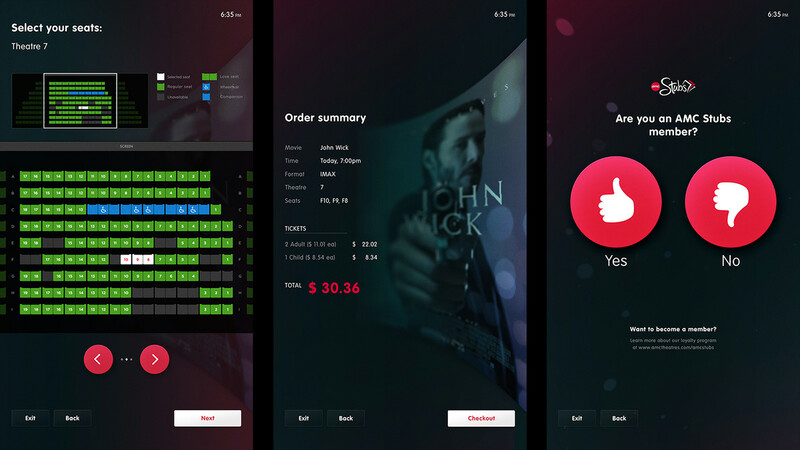 We created a rough tapable demo to get a feel of the improved user flow, made with Principle. Besides an improvement of the current ticket kiosk interface we also presented a future vision based on better hardware and software and different kiosk placement. 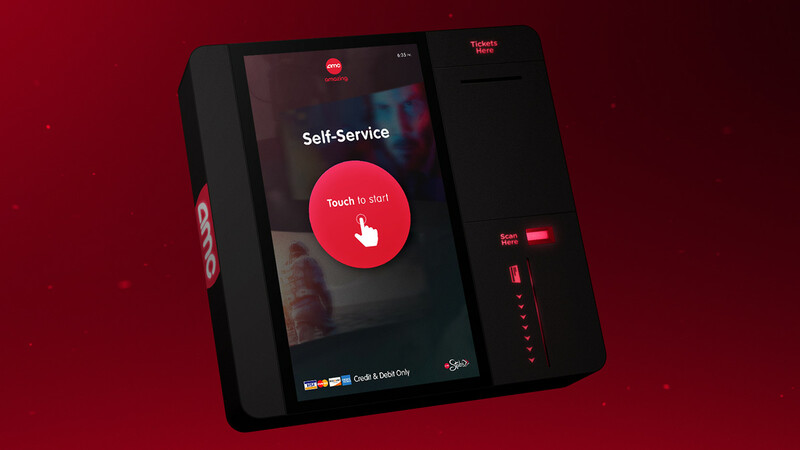 AMC Theatres approached Firstborn to help them improve their ticket kiosk sales. After analyzing multiple movie theatres, the kiosk positions within the theatres, the kiosk signage, kiosk product design and kiosk interface, we developed a plan of attack.